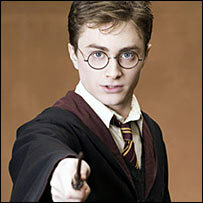 Daniel Radcliffe is best known for playing the lead role in the five Harry Potter film series. The most recent, Order of the Phoenix, was released this summer. He is also signed up for the final two films. The 18-year-old actor talks about his reaction to the final Potter novel, Deathly Hallows, and how filming is going for the next movie, Half-Blood Prince. How does it feel to be part of such a successful film franchise? In a way I don't think of it as a franchise, it's just what I've been doing for the last seven years. It's been amazing for me in terms of the people I've met, and the friends I've made - some of whom I hope I'll know for the rest of my life. What are you favourite scenes in the Order of the Phoenix? But essentially any scene with Gary Oldman or Imelda Staunton would be the ones I would watch again - and I'd just close my eyes when they cut to me. You're one of the most recognised faces in the world. How do you keep your feet on the ground when other young stars - like Britney Spears - are having such a tough time of it? I think there's a big difference between the way you grow up in America and in England if you're in this kind of position. In America, they'll treat you as an actor first and a child second. In England they treat you as a child first and that's the way it should be. Any 11-year-old who suddenly realises that that they can have anything they want is going to abuse that power, and you just need people around them to be honest and say "don't behave like that". I'm not sure that happens to the same extent in America. You just started filming on the sixth Harry Potter film, the Half-Blood Prince. How's it going so far? Really well. I've just been doing a bit of work with Jim Broadbent who plays Horace Slughorn, who's just fantastic. And we've been doing a bit of stuff with me and Rupert [Grint, who plays Ron Weasley]. We haven't done any scenes with all the kids yet in the Great Hall - that's all to look forward to just after Christmas. It's glorious to be working with [director] David Yates again. Is the next film going to have a different feel to Order of the Phoenix? I think it will. In some places it will be quite a lot lighter, which is hard in a way for me because my natural instincts and personality tend towards the darker side. It's also nice to let people see Harry's sense of humour... but toward the end of the film it gets as dark as the fifth ever was. The final book Harry Potter and the Deathly Hallows came out in July. What was going through your mind as you read it? I didn't read it until about four days after it had come out, by which time most of the world knew what had happened, so I was going round with my fingers in my ears. I did manage to read it without anyone else spoiling it for me. And I was thrilled. I'm glad I'm having a bit of a break between this film and number seven, but I'm very much looking forward to doing it. Harry Potter and the Order of the Phoenix was released on DVD on Monday 12 November. Daniel Radcliffe was talking to BBC Entertainment reporter Tim Masters.